A review of Living Colour's new album The Chair In The Doorway on I Heart Guitar reminded me of my meeting guitarist Vernon Reid in 1982. 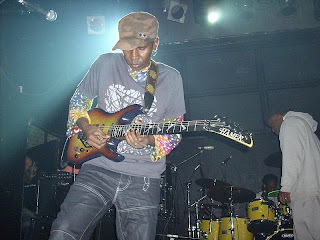 Still a couple of years away from forming the Grammy award-winning Living Colour, Reid was your typical struggling New York-based avant-garde/jazz musician and a sideman with Ronald Shannon-Jackson's Decoding Society. Led by bandleader and drummer Shannon-Jackson, the music of The Decoding Society could best be described as avant-garde/funk/jazz/rock, played by members who were all proponents of Ornette Coleman's harmolodic concept. It is my understanding that a certain amount of training under Ornette himself, or one of Ornette's disciples was required before one could be considered 'qualified' to play in this style. I saw the band perform as part of the 1982 Singapore Jazz Festival and they were pretty mind-blowing. Vernon's style was a combination of post-bebop, 'sheets-of-sound'-era Coltrane and Hendrix-psychedelia. Playing an early all-graphite Steinberger prototype and a 6-string banjo tuned like a guitar, Vernon plugged into an array of what must have been 12 or more pedals (sans pedalboard) that he set up individually on the floor in front of him. Of course when a Decoding Society jazz workshop was announced, I could not pass it up. At the workshop the day after the gig, the band was obviously keen to educate everyone present on harmolodics -- I recall bandleader Shannon-Jackson making a reference to 'evangelizing' Ornette Coleman's concepts. We were barely 10 minutes into the workshop when things took an interesting turn -- a fire had broken out in the Chinese restaurant in the concert hall building, which led to the band and the workshop attendees being 'evacuated' by chartered bus to the Ramada hotel where the band was staying. In the lobby of that hotel, I had a chance to sit down next to Vernon with a couple of other guitar playing buddies of mine -- fortunately for us, most of the workshop throng were either drummers, bassists or horn players. From what I can remember, Vernon talked at length about his musical influences and his lessons with jazz guitar great Ted Dunbar whom he obviously had a great deal of respect for. He also spoke about the necessity of being familiar with the various eras in jazz and proceeded to rip some pretty convincing bebop lines on his Steinberger. In an about turn, Reid then started playing a beautiful chord-melody in the style of Barney Kessel/Johnny Smith. The cat is versatile! And when someone asked what one should do if the country they were living in did not support the arts or a career in muic, Vernon's reply was simple -- "Leave! And go somewhere that does". It impressed upon my 18-year old mind the kind of fearless journeyman attitude one must have if one chooses to make music one's life path. Buy Living Colour CDs And DVDs Here!